How can we reduce the impact of severe weather events? What do Newton's Laws of Motion have to do with automobile safety? How do the production and disposal of chemical products affect the environment? 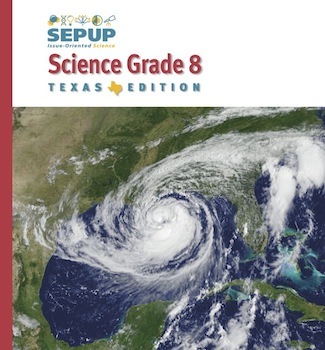 SEPUP Science Grade 8 is an issue-oriented year-long science course created to meet the Texas Essential Knowledge and Skills (TEKS) for the 8th grade. It is organized into six units. SEPUP Science students conduct experiments, collect and analyze data, create models, and read and analyze information. There is a +400-page, hard-cover student book, a complete Teacher’s Guide, and a kit containing the laboratory equipment and supplies required to conduct course activities. The kit provides supplies for use with up to five classes of 32 students each. The role of humans in environmental change is explored. Students graph the effect of changing biotic and abiotic factors on a population. They describe the relationships that occur within different ecosystems while conducting various laboratory investigations. Students investigate motion and changes of motion such as speed, velocity, and acceleration. They calculate speed, graph motion, and learn about the effect of speed in vehicle collisions. Newton’s Laws are also applied to the context of car crashes and everyday experiences. Students investigate the properties of elements and how they are determined by their atomic structure and position on the Periodic Table. They use chemical formulas to determine the structure of a compound, investigate chemical reactions, identify balanced equations, and explore conservation of mass. They relate their understanding of chemicals and chemical reactions to the production, use, and disposal of chemical products. Students explore how natural events such as earthquakes and severe weather affect people and communities. They investigate the factors that cause climate and weather, including energy from the sun, atmospheric movement, and global ocean currents. Students interpret topographic maps to predict how weathering is likely to reshape land features. Students also examine the historical development of plate tectonic theory and the influence of plate tectonics on crustal features. Students investigate the day-night cycle and Earth’s rotation around its axis. They also explore Earth’s axis tilt and revolution around the Sun to explain Earth’s year and seasonal changes in day length and average temperature. They investigate the reason for the lunar phases and how the Sun and Moon affect Earth’s tides. The relationship of the solar and lunar cycles to different calendars and how variations in these cycles and axis tilt would impact a planet are also explored in this unit. Students investigate components of the universe, such as galaxies, nebulae, and neutron stars. They learn about the life cycle of a star and model the Milky Way. They consider the vast distances in space and time and theories for the origin of the universe. Students suggest and evaluate future research projects aimed at gaining more information about the universe.